Charlie Kelly and Taylor Reynolds co-founded the new A&A CubeSat Team. A major challenge of any astronautics program is that while theories and technologies are developed for space, there are limited opportunities to work and test in space. This challenge was not lost on Aeronautics & Astronautics (A&A) graduate students Charlie Kelly and Taylor Reynolds, who wanted to bring space within reach of students in the department. 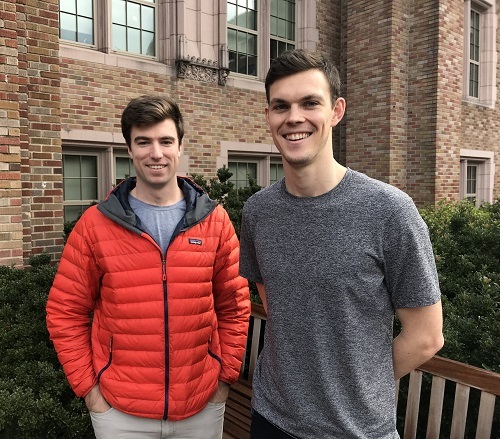 Armed with a proposal and support from A&A’s administration and faculty, Kelly and Reynolds secured seed funding from the University of Washington College of Engineering and its A&A Department to establish the A&A CubeSat Team, with plans to launch a CubeSat every two years. The team has attracted support because of the opportunities to intersect with curriculum. Not only are team activities being included in Master’s theses and independent study, but the Aerojet Rocketdyne Foundation contributed generous funding to support the team’s first senior Capstone project this year. 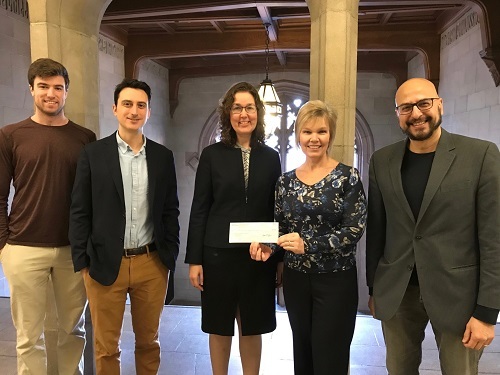 Aerojet Rocketdyne's Jan Prachar (2nd from right) presents a check for the A&A CubeSat Capstone to (from l-r) Charlie Kelly and A&A professors Justin Little, Kristi Morgansen, and Mehran Mesbahi. This first CubeSat, the Satellite for Optimal Control and Imaging, dubbed “SOC-i” with a nod toward the Pacific Northwest salmon, will have a specific mission to reconcile two constraints in its orientation and imaging systems. 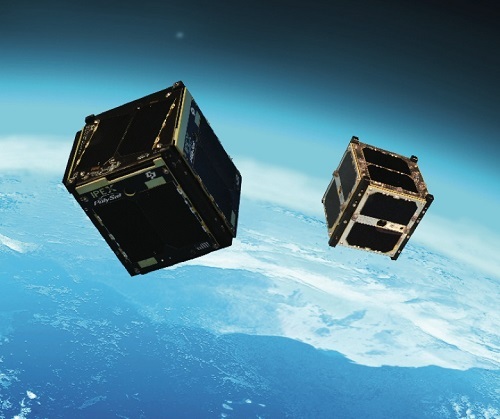 CubeSats in orbit. Photo source: NASA JPL. The timeline for launching SOC-i into space depends upon when the team advances the CubeSat enough to apply for a ticket on a NASA rocket. Even with approval, there are several tests and requirements to pass, so launch could be a year from an accepted application. Current plans have SOC-i ready and applying for a ticket by Summer 2020, with its launch sometime in 2021.